Great recipe that is full of flavor. I added artichoke hearts and served over zuchinni noodles. Hi! This looks amazing and I would like to make it into a crockpot meal. Do you have any tips for this? His. I would like to know how the recipe turned out cooked in your crockpot/slow cooker. I’d say, you’d need to slow cook the chicken in the broth, garlic powder an seasoning first, for about 3 or four hours. I wouldn’t chop it though. I’d just chuck em in whole and shred them up with a fork once cooked. Anyway, after chucking in your pasta, keep it boiling for around 30 – 40 minutes, or up to an hour for the whole wheat kind, and then after that you slowly pour in the cream while stirring the pot and leave the lid off while stirring from time to time if it’s too thin. Once it’s near the thickness you want to achieve, slowly stir in the parmesan (I would consider using more parmesan or some other cheese than the original recipe) and then chuck in the chopped spinach and sliced sundried tomato and let cook for a little longer if you want, or serve straight away. 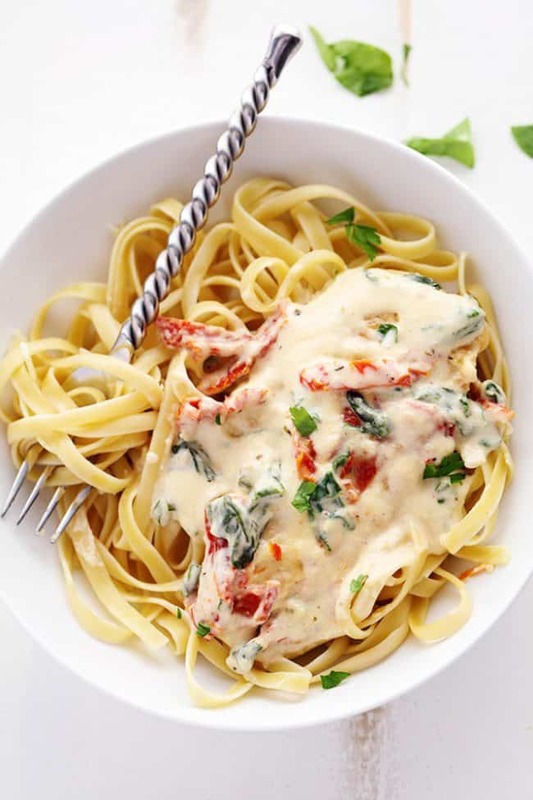 I personally would not cook more after adding those last two ingredients, because the meal would be quite heavy and I’d want the freshness of the spinach and juicy sundried tomatoes to counteract the creamy texture of the pasta and sauce. This would be a more chicken-y, softer, warmer feeling pasta to the original version. The chicken would not have the sweet crispy golden crunch it does when made stove top. Still be yummy but considering how fast the original recipe is, you might be better of just leaving it how it is. If you want to prep this ahead of time, and that’s why you want to slow cook it, you could make the shredded chicken / broth / seasonings up ahead of time, then and portion into containers and freeze or refridgerate it. Then when you wanted a serving, you could chuck one of broth things you made into a pot, chuck some spiral pasta (when theres enough melted liquid, if you’ve taken it from the freezer) and then add the rest of the ingredients once its boiled off to the consistency you want. Anyway, I could be wrong about all this but that’s my prediction for how you’d make this in a slow cooker hahaha. Good luck! Do you have any suggestions that you did in crockpot as far as how long? I’ve made this twice now – very good recipe – thank you! I didn’t use sun-dried tomatoes because my husband can’t have the sodium. I did add mushrooms and served over pasta. Now I want to try your honey walnut shrimp. Thank you for posting. Hello! This sounds so good and I want to make it so bad. Just one thing. No one in my house, including myself, likes sun dried tomatoes. Do you know if there are any alternatives for it? You are welcome to leave it out. You could sub it for mushrooms if that is better. It will just alter the taste of the chicken too though. Try red bell peppers. Mushrooms. Zucchini or Crookneck squash. Pearl onions. looks great..going to add fresh portobello’s and sub the cream for 2% milk..thanks for the recipe. Awesome and delicious. It was very easy to make. My family totally loved it. Thwy said it was restaurant quality. You were right when you wrote that this was a restaurant-quality meal. I made it today, and it was sensational. I doubled the sauce, as you suggested, and served it over a garlic parsley fettuccine from Bed Bath & Beyond. Absolutely delicious! the cream sauce separated, cheese looked like a curdled mess and was very watery. Not sure what I did wrong.. I just got bowls out and we ate anyways. Will try again, and see. Wasn’t much to look at, but all was eaten, so not a total fail. Can this be made w canned tomatoes instead of sun dried. Could I make this with steak instead of chicken? I made this for myself. I typically cook on big meal per week for dinners and lunch. I added mushrooms and used canned tomatoes instead of sundried. I doubled the sauce , but had to add flour to thicken it up. I put it over angel hair pasta! I loved this recipe, and will definitely make it again! Use real Galic cloves, smash with a wide blade knife and tack away the shell. It makes a total difference in taste compared to powder. I made this several weeks ago and we are having it again tonight. It’s delicious. We thought it was even a bit better for leftovers the next day as it thickened up a bit. I love your recipes. How did you reheat the leftovers? I am thinking of making it ahead of time for a dinner party. Hi, can I skip the parmesan? Maybe sub it with mozerella, will it make the taste different? I once had grated Parmesan added to some food and really disliked the smell and taste, but this going to get cooked… Should I try cooking with parmasan or sub it? Unfortunately, that is a key ingredient in the recipe. I was making this spur of the moment and didn’t realize I was all out of Parmesan until it was too late. I used feta instead, which I wasn’t sure how it would turn out, but tasted great. I added some chili paste and onions. Was really delicious. Real grated parmasean is totally different than Kraft grated parmasean. It has a strong flavor though so if you want a milder cheese, something like a colby would have a nice flavor. Mozarella is nice on top but does not mix well for sauces. Try Pecorino Romano, similar to Parmesan but made with sheep’s milk. Slightly different taste but I use it to sub for Parm because I’m allergic to cows milk. So yummy i cooked chicken in chopped garlic and add 3xtra 1/2 cup of fresh parmesan cheese. I put it over zucchini zoodles! I have made this recipe several times for family and company and always get rave reviews. The only thing I altered was the cream. I use whole evaporated milk instead, because that is what I always have on hand. I also cut the chicken up in small slices instead of serving whole chicken breasts. I can stretch 2 chicken breasts to feed 4 to 6 people this way. 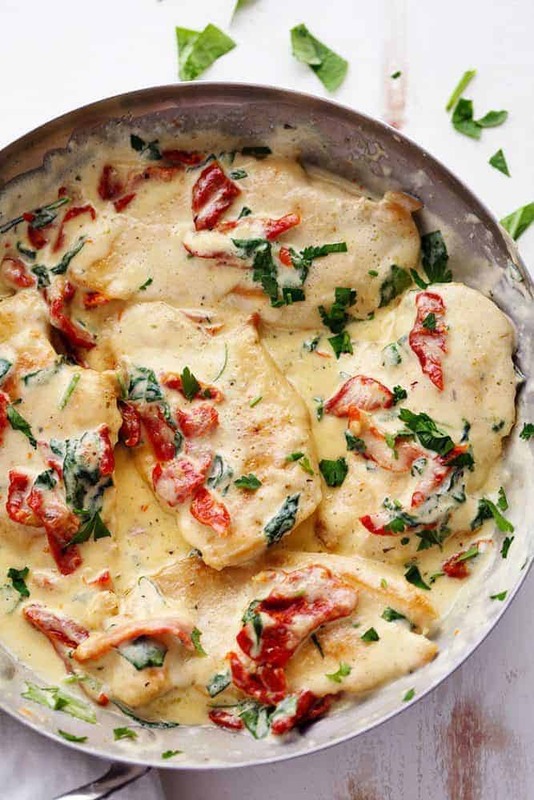 Serve with green salad and artesean bread for a wonderful meal! This was great! I doubled the sauce over pasta. I used almost an even amount of chicken broth and heavy whipping cream. For the chicken, I threw in smashed garlic and seasoned both sides with salt and pepper. I used fresh tomatoes and mozzarella cheese as I didn’t have parmesan cheese on hand. The sauce didn’t thicken, so I used a little cornstarch mixed with water as a paste. Came out delicious! Just wondering what the nutritional values are in this recipe. I love this recipe. Every time I make it for company, I am asked for the recipe. It’s delicious. The first time I made this I did it in my frying pan, the second time my Dutch Oven. I always make this in my Dutch Oven now. Hands down it’s more yummy. There’s something about cooking in a Dutch Oven that enhances the flavor. I love all of your recipes, this is one of our favorites. I make mine in a cast iron skillet – amazing! And I add 4 minced garlic cloves to the pan after I take out the chicken and sauté until you can smell it. Then I also use the garlic powder because it really makes the recipe. For keto people like myself, you can thicken the sauce with xanthan gum (just a little goes a long way). Then I serve over cauliflower rice that has been sautéed with caramelized onions. Heaven! I made this tonight – family loves it. I used sun dried red peppers because I can’t fine sun-dried tomatoes anywhere. Next time I make it there will be a half pound less chicken, and corn starch to thicken the sauce. Sauce was too thin for us. Strange I can’t give it less that five stars the program wont let me. Sun-dried tomatoes can be found in any regular grocery store in the produce section or in jars with the tomato products. They are usually in herb oil…and are delicious. If you can’t find them there, you can sometimes get them on Amazon. Just thought I’d give you a heads up. This truly fantastic. Your right, a good restaurant quality dish. I have a question. 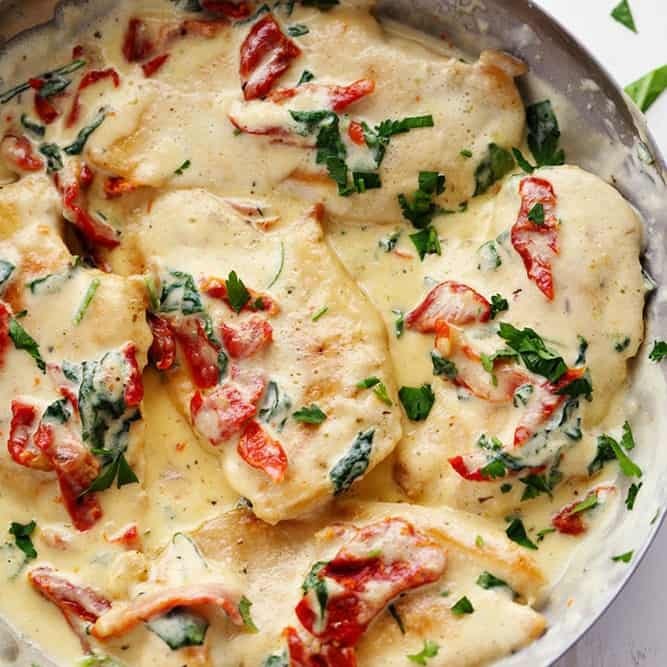 I have a lot of people coming and staying over the holidays and wondered if this Creamy Tuscan Garlic Chicken can be made ahead and frozen. 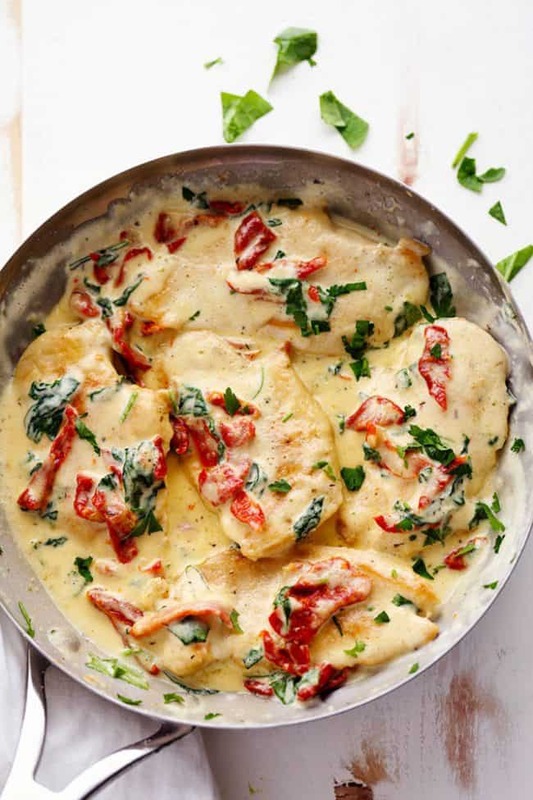 My families favourite chicken recipe and so easy to make. Thank you! This was a huge hit with my family! Thanks so much for the recipe! i am always making your recipes. so far all are awesome. 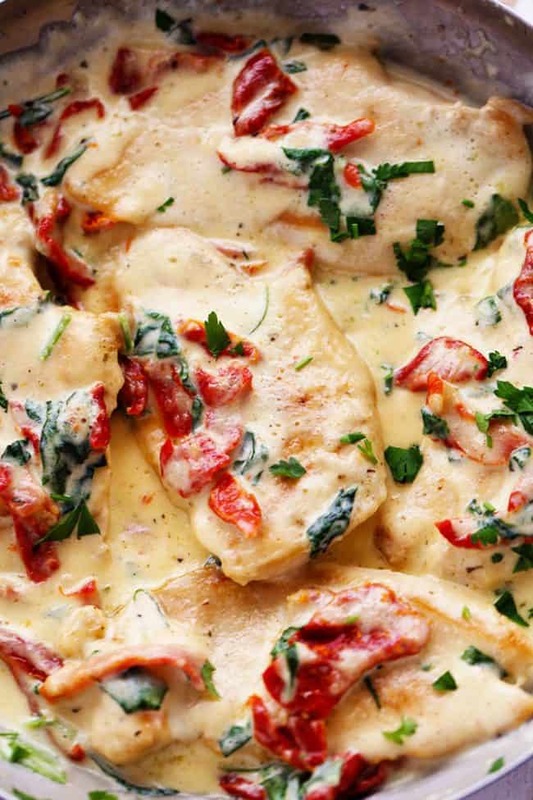 What’s the calorie count for the creamy Tuscan chicken? I NEVER post reviews for recipes, but I had to for this one. Every recipe of yours so far that I have tried has always been successful, but man oh man, this one (Tuscan garlic chicken) was so amazingly delicious! I, like others, don’t really care for sundried tomatoes – so what I did was add sliced cherry tomatoes. I doubled the sauce recipe as suggested and tossed it with fettucine pasta. There is a little bit leftover, and I know we will all be fighting for it on leftover night! Thank you! Made this tonight!! It was so good. I did make a few subtle changes. I doubled the sauce but used a 1/2 cup of chicken broth and a 1/2 cup of white wine, and instead of garlic powder I used 4 cloves fresh garlic and also added about a teaspoon of red pepper flakes. Served over fettuccine. Double thumbs up from everyone! I followed your recipe exactly and the kids couldn’t believe it didn’t come from a restaurant. We loved it. Thank you! Just now adding my rating! Loved it, big eating firefighter was a huge fan. Delicious! A new favorite in my house. I’m trying to do Keto friendly meals so I paired the chicken with a side of mashed cauliflower to make it complete. The only things I changed were that I seasoned the chicken with sea salt and black pepper before cooking and used 1 tsp. of minced garlic and sautéed that in the pan after removing the chicken, before adding the other ingredients. I also added a little sea salt and black pepper to the sauce. It came out perfect and I can’t wait to make it again soon! Wow, what a marvelous blog. I was searching for this info from a long time, but thanks to you. I am going to try this out. Thank you. I will make this one again! Great tasting recipe! However really needs nutrition info and serving sizes. This recipie was amazing! I doubled the chicken a made four times the sauce. I added some minced garlic and a dash of onion powder, as well as salt and some fresh cracked pepper. In addition to this I cut the chicken in to strips before returning it to the sauce, and roasted some pine nuts to add to it. I served it over penne pasta and sprinkled some fresh Parmesan on top. It was absolutely delicious and so easy! I made this last night. Very easy and beautiful to look at. I doubled the sauce. Instead of the cream I used half and half with a small amount of cornstarch to save on the fat content. I also added a small jar of artichoke hearts, rinsed, and fresh garlic. It was delicious! Fam FAV alert! This dish is so DELICIOUS! I used Italian julienne cut sun dried tomatoes in a bag from Giant aka Martins and oh my goodness the flavor is amazing! Yes, of course! That sounds delicious! Enjoy! Thanks for the question. I use a couple of different websites for nutritional facts, skinnytaste.com and myfitnesspal.com. They are both great ways to track any facts that you need. Thanks for following along with me. Please let me know how the recipe goes. Could you use anything in place of the chicken broth? Would water be okay? Thanks for the comment. You probably could use just water but it would change the flavor. Chicken broth is the best option for the flavor! Thanks for following along with me! So this was AMAZING!! Thank you for such a great recipe. Used garlic cloves instead of powder and Doubled the Sauce. Subbed half and half for the heavy cream and it was fantastic. Might try evaporated milk to see how that is next time. This recipe seems like a tough one to mess up, even for me! I always love to hear when people add new ingredients and it turns out great. Great work! Thanks for the comment and for following along with me. Posting another comment because I forgot to include the FIVE stars it deserves.